We are very pleased to announce that the Data Concentrator Unit with balancing meter functionality, Andra Commander amiDC-3, has successfully passed the PRIME certification in a laboratory accredited by the PRIME Alliance. Completed tests for a data concentrator in the PRIME standard, so-called "Base Node" confirms that the device is interoperable, which means it can communicate with the meter of any manufacturer, provided that the meter also implements the PRIME standard. In the world, over 15 million devices operating under PRIME protocol have been implemented so far. 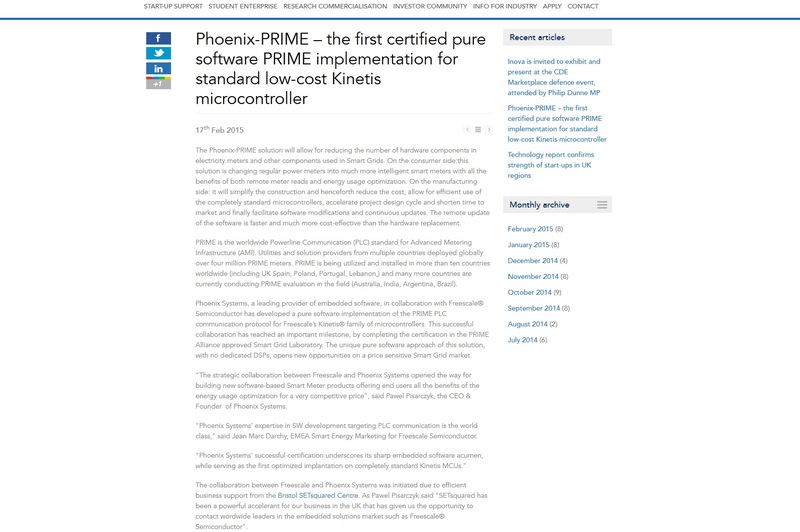 ZKB uses the first in the world, purely software implementation of the PRIME protocol - Phoenix-PRIME, as well as the Phoenix-RTOS real-time operating system. The device has been implemented so far in the Energa-Operator network in the amount of 6,600 units. Further implementations are coming. Management and employees of Atende Software wish you calm and joyful time with your loved ones and friends during this bery special Christmas days. May the New Year bring you lots of happiness and prosperity. Phoenix Systems is testing a new version of its real time operating system – Phoenix-RTOS, perfectly suitable for microcontrollers implemented in new Internet of Things devices. These 40 nm microcontrollers offer significant computing power while using little energy. However, to fully utilize their potential, they need an operating system – just as computers or mobile devices. Phoenix-RTOS is the only operating system that allows to fully take advantage of these microcontrollers features as well as shorten time to market and deployment of new devices. The development of the devices is also possible thanks to new hardware solutions, such as NXP i.MX RT Series. The convergence of low power applications processors and high performance microcontrollers is possible with i.MX RT Series - the industry’s first crossover processor, offering the highest performance Arm® Cortex®-M core, real-time functionality and MCU usability at an affordable price. Together with Phoenix-RTOS operating system, it enables a whole new spectrum of possibilities for producers of IoT devices. "Phoenix Systems is providing best in class software solutions for the metering space including communication protocols. Their latest Phoenix-RTOS product enables a brand new approach of microkernel-based real-time operating system for high-end MCUs like i.MX RT" – states Jean-Marc Darchy, Smart Energy Regional Marketing Manager in NXP. "It will allow us together to extend the reach of software defined solutions based on i.MX RT and running under the control of this disruptive new operating system." According to Juniper Research, the number of connected Internet of Things devices, sensors and actuators, will reach over 46 billion in 2021. It unlocks new business opportunities, both for the producers of intelligent devices and IoT software developers. The main challenge for these new products is enablement of software-defined solutions, where previously hardware was needed. The new microcontrollers, such as NXP i.MX RT Series along with Phoenix-RTOS, is an answer to the market needs of device development for IoT, Smart Metering and others. The development of Phoenix-RTOS operating system began in 1999 at the Warsaw University of Technology, and in 2011 first commercial implementations were completed. The second version of the system has been applied in smart meters and smart data concentrators, developed for one of the main Polish utility companies Energa-Operator as well as in intelligent gas meters. The third, current version, is now tested for multiple deployments. "Phoenix-RTOS allows to quickly prototype and deploy new Internet of Things devices, which mean their faster delivery to the market. Today this agility and instant change implementation defines company’s position on the market" – states Paweł Pisarczyk, CEO of Phoenix Systems. "The first sector that appreciated Phoenix-RTOS is utility and energy industry, but its architecture goes way beyond it and allows to manufacture also various other IoT devices". TVN Group has signed an agreement with Atende Software to provide the redGalaxy technology platform for the player service. Created and developed by Atende Software, the redGalaxy platform is used to build Internet television and share high quality content with a virtually unlimited number of viewers. The platform comprises a suite of tools for providing Internet TV services. So far, player has used the redGalaxy service for multimedia content storage, transcoding and distribution. Under the contract signed in September 2017, the scope of this collaboration was expanded to include the redGalaxy Portal. This component was used to build the new player and its content management module. On the night of 21/22 November 2017, the player service was migrated to the new technology platform following a successful project implementation, which took less than three months to complete. The contract also provides that Atende Software will also be responsible for system maintenance and service development. With the launch of the new technology platform, player users now have access to the player+ offering, which is a result of a collaboration between TVN and ITI Neovision. Player+ is the best collection of live programming, including CANAL+ premium channels, as well as shows and TV series produced by TVN, and VOD libraries from nc+. "Atende Software has created a world class OTT solution. We particularly appreciate its reliability and performance as well as its impressively short implementation time" – says IT Director at TVN Przemysław Aksiuczyc. "TVN Group has been using our CDN service since 2011 to stream content to the users of its player service. We are proud because the expansion of our cooperation is a clear confirmation of the trust placed in us. We believe that our experience will contribute positively to the further development of the platform, enhancing service quality and user comfort" – says Przemysław Frasunek, Multimedia & Security Division Director at Atende Software. TVN is the leading broadcaster in Poland which belongs to the American media company Scripps Networks Interactive (SNI) – the leading developer of engaging lifestyle content in the home, food and travel categories for television, digital, mobile and publishing. SNI’s global networks reach millions of consumers across North and South America, Asia, Europe, the Middle East and Africa. TVN currently operates 14 channel brands, including i.a. popular thematic networks: TVN24, Poland’s most-watched private, round-the-clock news station, TVN Style, the #1 lifestyle channel, TVN Turbo, the key destination for men, TVN Fabuła, showcasing best movies and hit series. The company also provides an extensive range of online products, including Poland’s most-engaging video-on-demand service - player. The broadcaster’s portfolio encompasses TVN Agency, offering a comprehensive variety of news production and distribution services in Central and Eastern Europe, as well as TVN Media – one of the leading advertising brokerage offices in Poland. TVN together with CANAL+ Group, jointly operates nc+, the leading Polish premium direct-to-home (“DTH”) digital satellite platform. The Poland-Finland Business Forum titled " Innovation trends and future challenges" starts tomorrow in Helsinki. The forum aims to encourage investors to joint ventures and invest in innovative projects, including those related to renewable energy. The Forum will be opened by Andrzej Duda and Finnish Deputy Prime Minister, Minister of Finance of the Republic of Finland Petteri Orpo. During the Forum 3 companies from Poland and 3 from Finland will join a Panel Discussion on opportunities, challenges and focus areas highlighting the cooperation between Poland and Finland. One of the speakers is Pawel Pisarczyk, CEO of Atende Software. The business Forum is organized by Ministry of Economic Development of the Republic of Poland, The Embassy of the Republic of Poland in Helsinki, Finpro, Confederation of Finnish Industries EK, The Federation of Finnish Enterprises and Finland Chamber of Commerce. 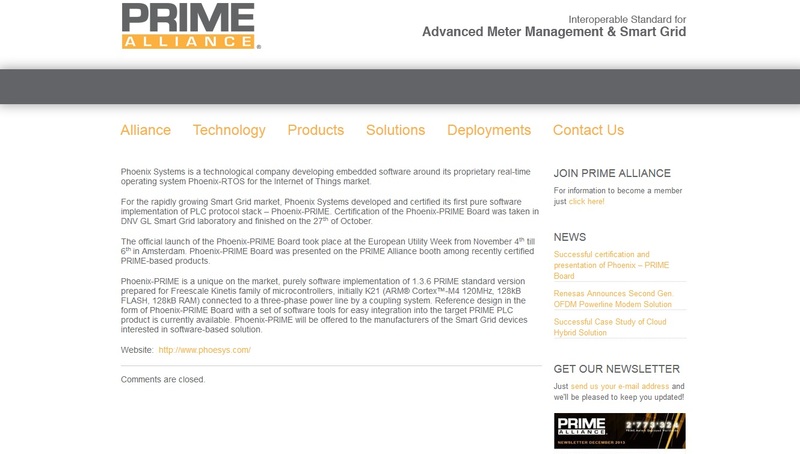 At the European Utility Week, Phoenix Systems will present a new version of Phoenix-RTOS real-time operating system suitable for microcontrollers widely used in Internet of Things devices. New 40 nm microcontrollers like latest NXP i.MX RT line of products offer significant computing power without increasing power consumption. However, to fully utilize their potential, they need an operating system – just as computers or mobile devices. Phoenix-RTOS is the only operating system that allows to fully take advantage of these microcontrollers features, simplify new devices deployment and shorten time-to-market. According to Juniper Research, the number of connected Internet of Things devices, sensors and actuators will reach over 46 billion in 2021. It unlocks the new business opportunities, either for the producers of intelligent devices or the IoT software developers. The main challenge for the new products is enablement of software-defined solutions where previously dedicated hardware was required. The new, inexpensive microcontrollers alongside with Phoenix-RTOS are the answer to the market needs to device development. The development of Phoenix-RTOS operating system began in 1999 at the Warsaw University of Technology, and in 2011 first commercial applications were completed. The second version of the system has been applied in smart electric meters and smart data concentrators, developed for the major Polish utility company Energa-Operator and in smart gas meters for the leading European vendor Apator Metrix. The third, current version, will be showcased at the European Utility Week 3-5 October in Amsterdam. “Phoenix-RTOS allows to rapidly prototype and deploy new Internet of Things devices, which means shorter way to the market. Today this agility and instant change implementation defines company’s position on the market” – said Paweł Pisarczyk, Phoenix Systems CEO. “The first market sector that benefited from Phoenix-RTOS is utility and energy industry, but it’s superior architecture goes way beyond it and open the way to manufacture various other IoT devices’. Currently Phoenis-RTOS is tested in avionics industry, where it can be widely used e.g. in drones. More information about Phoenix-RTOS is available on www.phoenix-rtos.com. redGalaxy a cloud-based OTT solution - allows rapid deployment of new internet TV platforms, thanks to end-to-end online video management and processing toolchain. redGalaxy, being a comprehensive OTT solution, consists of all modules needed to run your own TV: content delivery network, content archive, transcoders, media asset management, web portal and end-user applications. „redGalaxy is the largest OTT platform in Poland, every day we serve almost 400 Gbit/s of streaming traffic. Among our clients are major broadcasters like TVN, two biggest mobile network operators: PLAY (P4) and Plus (Polkomtel) and multiple CATV/DTH providers, including NC+, Vectra, Multimedia. This year, we supported one of the largest streaming events in history of Polish internet – the KSW39 Colosseum MMA fights. Now we are ready to go global.” says Przemyslaw Frasunek, director of multimedia department in Atende Software. IBC is the world's leading media, entertainment and technology show. Meet Atende Software from 15 till 19 September at hall 9 LP21.